Yes, count them: Three. The first was yesterday with my family: Mom, Dad, and Krista. Then Christmas Eve, we wake up and have our own little Christmas day. Then on Christmas Day, we spend the whole lovely day flying standby to Missouri to spend a week or so with Tone's family. Could we be more spoiled????? I just hate the fact I have to spend ALL of Christmas Day flying. I don't know, but I think Hunter's a bit excited. It was Sissy's nap time, so she wasn't so much. Checking out the little things that were put in their stockings. Sissy unwraps a doll. All of a sudden, she's interested in the "beebee." As soon as Grandad gets it out, she starts kissing it. Unwrapping a book. How well they know her. Books and babies. Her favorites. Hunter got a big Lincoln Log set, so he was pretty much set for the next two days. That's all he did was build houses. Hunter finally got to decorate the cookies that he missed out on because he was sick. His best friend, Emma, from next door helped us out. They thoroughly enjoyed it. Ainsley thought she was so big too as you can tell by the look on her face in this next picture. I spent most of the time watching her and cracking up. At this point, four cookies have tops nibbled off as Ainsley decided to taste test each cookie within her reach. I gave her one to focus on, but that wasn't as fun. So here she is yelling at me when I took them away. Emma put the chocolate sprinkles a little too close to Ainsley who took a huge handful and flung it on her cookie. Then she didn't like the sprinkles stuck to her hand and started shaking and flinging them all over the kitchen. Then she attempted to eat the sprinkles, which she decided she didn't like and starting spitting them out. She even has them stuck under her nose. She's had enough, and is mad at the sprinkles and is shaking/clapping her hands violently to get rid of them. Random picture of Hunter who rediscovered his swim goggles yesterday. He is eager to get the super hero cape I sewed him for Christmas to complete his look. He told me he can't be a superhero yet until he gets his cape. We also went to the park to feed the ducks and play in the leaves on Sunday. 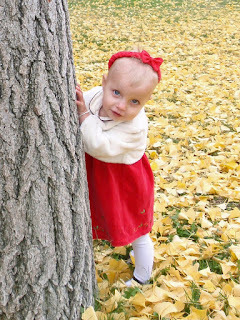 They were in their Christmas clothes for church, I got some great pictures of them in the fall leaves. I love these two pictures of them peaking around the tree. I think I just might frame them. Feeding the ducks and geese. You can't tell in these pictures, but they were just swarming around us, so I put the kids up on this grate out of harms way. The geese came up to their faces and some were hissing, so I didn't want them that low to feed them. Hunter thought that this was delightful, and had so much fun. We were here for about 45 minutes. We had a huge bag of old bread. I had to watch Ainsley because she would eat the bread instead of throwing it. Yuck! Ainsley wasn't really too sure about the whole thing. She thought the geese were a bit scary. We also had Starbucks to top the whole day off. Yummy. Hunter had kids hot chocolate, and I had the gingersnap latte. Ainsley was happy with just the coffee cake. A little treat, because unlike most of America, we rarely go to Starbucks. But I had a gift card. Where she found Hunter's underwear is beyond me. I'm just hoping they didn't come out of the dirty clothes basket. She loves hats and puts everything on her head. I snapped a couple pictures and posted them real quick. HAHAHAHA! One of the most embarrassing things she has done is in Victoria Secrets. I went there for the underwear sale, and she pulled some out of the drawer, put them around her neck like a necklace, and started walking out the door! She la-LOVES hats and necklaces, and anything that looks close goes on her head or around her neck! Hunter wanted to make sugar cookies because he saw them in a book. So he begged and begged for them all day. Then he came down with the flu and looked like this right when I was making them. The poor guy tried but ended up putting his head on the counter and spent the rest of the next two days on the couch with his barf pan. I wouldn't let him even touch anything cookish then. Since he never touched the dough or cookies, I think my cookies are somewhat sick-germ safe. Plus, they get cooked in an oven anyways. She sat on a tall stool and watched me. She sampled every step, and even got to lick a beater! This is just the best Mommy! Then she thought she would help me eat the dough while I was trying to roll it out. If I didn't watch her, she reached over every two seconds and took pieces to eat. I think I'll just take a little sample of these scraps Mommy! Occasionally, she would remember that we were here to actually make cookies and she would attempt to help out. She is grunting and pushing down as hard as she can on this cookie cutter. Notice, only the top ear of this bear is even hitting any dough. But Daddy gave her a high five for good effort anyways. I say give her a high five for resisting eating the dough for a few seconds. What? Do I have a little flour on me? All done! We did it! Hopefully, Hunter will feel better tomorrow, and we can move on to the next step: frosting them! It's such a good recipe though, they almost don't need it. 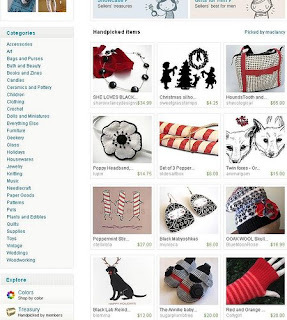 Not only was I featured on two great sites, but I also made the front page of etsy TWICE! Here are the shots of the front page. Interestingly enough, it was the same shoe that made it, and not one of my better sellers (although I personally love the shoe myself!). This was on the front page November 28th. This was on the front page December 5th. 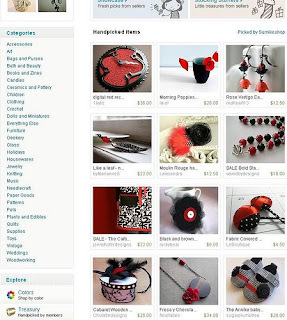 This page generated a ton of hits and some sales, so it must have been up at a good time. Anyways, I was proud of myself, and quite pleased. You must excuse me for bragging. I really was surprised! I got behind making shoes this last week. I guess I just wasn't prepared for Christmas buyers. Today I had 10 items to make! Most items take me an hour or so, so I had to move my sewing machine to the living room and sew during the day while the kids played beside me. Hunter was none too thrilled. But I am over 100 sales now, and in a week, I pulled in more than half of what I have been making in a month! I also just made an adult sized shoe for a special order. I think they turned out pretty darn cute. Don't ask for them though. I realized I short changed myself in the price, and they used up a ton of material. They were a custom order from the first month of selling when I would sell to anyone, but she didn't actually buy them until this last week. Oh well, live and learn. (That's brown felt by the way, not black. And that's a brown ribbon, not green). I have the most color issues with my camera. Getting it to take pictures of red and pink is especially tricky.